For a general introduction to amino acids, please see Amino Acids in Wikipedia. 3.3 No 23rd amino acid? Here are the names of the twenty standard amino acids, with their three and one-letter abbreviations. Mnemonic names are intended to help you to remember the one-letter codes, but are not the correct names. Click on the image below to see it full size. It shows the 20 amino acids plus one unusual amino acid, selenocysteine. There is also a list of standard amino acids at the Protein Data Bank. The asymmetric α-carbon in 19 of the standard amino acids (all except glycine) is a chiral center. Thus, each amino acid can exist in either of two optical isomers or enantiomers (mirror images), designated the L-form and D-form. 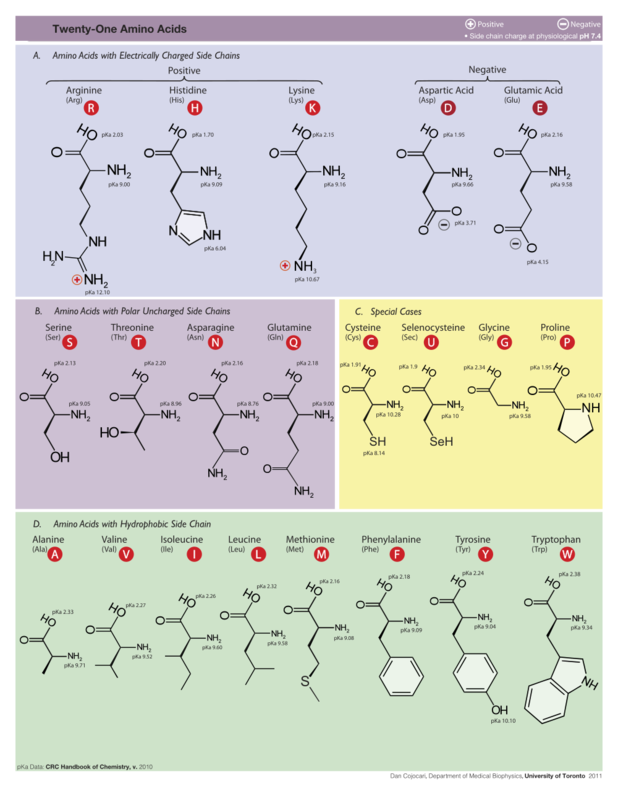 Nearly all naturally-occuring amino acids are L-amino acids, so named because they are analogous to the L-form of glyceraldehyde. (Not all L-amino acids are levorotatory; some rotate polarized light clockwise). Although D-amino acids are rare in nature, they do occur (see natural abundance in Wikipedia). D-alanine (DAL) occurs in over 100 entries in the PDB, D-leucine (DLE), D-phenylalanine (DPN), D-serine (DSN), and D-valine (DVA) each occur in over 50. Some of these entries are chemically synthesized, not naturally occuring. Gramicidin is a naturally occuring antibiotic containing several D-amino acids, e.g. 1nrm. 4glu is the 102 amino acid chain of VEGF-A synthesized entirely from D-amino acids. There are at least two non-standard amino acids that are genetically encoded, discussed below. In 2014, the PDB is in the process of adding these two to make 22 standard amino acids. Rare proteins in all domains of life include selenocysteine (Sec, U), designated the 21st amino acid. Over 38 entries in the PDB include selenocysteine, identified as SEC. pyrrolysine (Pyl, O) is a genetically encoded amino acid that occurs naturally in methanogenic archaea, sometimes called the 22nd amino acid. It occurs in several entries in the PDB. See more details. The 21st and 22nd amino acids are specified by the stop codons UGA and UAG respectively, modified with downstream stem-loop structures in the mRNA. Lobanov et al. searched "16 archaeal and 130 bacterial genomes for tRNAs with anticodons corresponding to the three stop signals". Their data suggest that "the occurrence of additional amino acids that are widely distributed and genetically encoded is unlikely." Angel Herráez has provided a tutorial introduction to amino acid structure in which each of the 20 amino acids may be visualized in 3D using J(S)mol. Please help to expand the list below to include all 20 amino acids. See also Glycine in Proteopedia and Glycine in Wikipedia, where the structure is shown. Glycine is the smallest amino acid, since its side-chain is nothing but a single hydrogen. Glycine is frequently found in turns, since the steric clashes of larger amino acids would be problematic. Turns typically occur on the surfaces of proteins, between beta-strands or alpha-helices. It is common to find highly conserved glycines in turns on protein surfaces, since mutation to a bulkier residue would interfere with the fold. Glycine also occurs in beta-strands and alpha-helices, although its frequency in alpha helices is low (second lowest, after proline, p. 125 in ). Glycine is commonly found at the C-terminus of alpha helices, and is considered a helix terminator (p. 125 in ). See Histidine in Wikipedia, where the structure is shown. The sidechain of His can be positively charged (protonated), in which case both of the nitrogens in the sidechain imidazole ring have hydrogens, and the charge is delocalized between them. The pKa for protonation is 6.1. This means that, on average at any moment, half of the His sidechains are protonated when the pH is 6.1. At the pH of blood, 7.4 ±0.05, His sidechains are positively charged less than 10% of the time. Therefore, His is not included in the usual list of positively charged amino acids (lysine and arginine). See Phenylalanine in Wikipedia, where the structure is shown. Phe participates in Cation-pi interactions. Phenylketonuria is a genetic disease in which the enzyme that converts phenylalanine to tyrosine is nonfunctional, leading to toxicity from excess phenylalanine, and tyrosine deficiency. See Tryptophan in Wikipedia, where the structure is shown. In trans-membrane proteins, tryptophans often lie at the interface between water and lipid. An example is the potassium channel, e.g. 1bl8. To see their positions, use the Find dialog in FirstGlance in Jmol. Trp participates in Cation-pi interactions. See Tyrosine in Wikipedia, where the structure is shown, and Nitrotyrosine. Tyr participates in Cation-pi interactions. ↑ A one-letter notation for amino acid sequences (definitive rules). IUPAC—IUB Commission on Biochemical Nomenclature, pages 639-645, International Union of Pure and Applied Chemistry and International Union of Biochemistry, Butterworths, London, 1971. Full Text. ↑ 2.0 2.1 2.2 See Chirality in Wikipedia]. ↑ See Pyrrolysine in Wikipedia. ↑ 7.0 7.1 Kessel, Amit, and Nir Ben-Tal. Introduction to Proteins: Structure, Function, and Motion. CRC Press, 2011. 653 pages. This page was last modified 00:25, 14 August 2018.